Our contemporary Amish Lexington 36" High TV Stand with Three Doors and Two Drawers is a marvel -- from the details to the construction to the storage options, it will afford you. Whether in your living room or office, this television stand will add modern elegance without being too over the top. Details like bevels, insets, and applied architectural elements give this piece character, but clean lines and a solid top and legs keep it down to earth. The three doors (one built standard smoked glass, and two built from solid wood) are on a sliding track. Behind the doors sit adjustable shelves (one behind the center door and two behind the left and right doors). You have the option to add smoked glass to the wood doors, as well as soft-close undermount drawers, and self-positioning, soft-closing sliding doors. 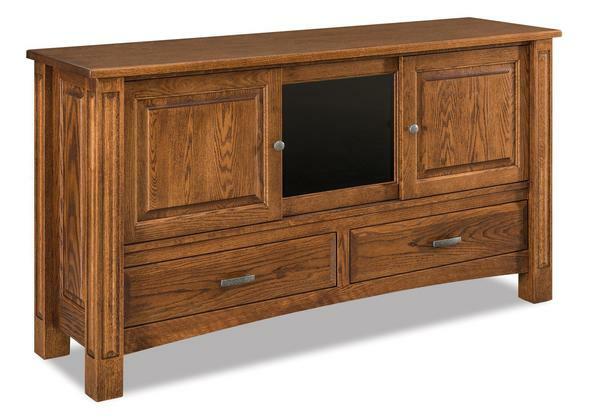 Customize this Amish-made television stand by choosing the wood type, finish, and hardware you would like it constructed in. Shown in Oak with Vintage Antique.